We've already had a look at the Christmas collections of Rituals and Sephora, but what would holiday beauty be without Lush? And this year we're starting off with good news because everything from last year's Christmas collection is again available this autumn/winter at Lush. Comparing the products from last year (check this post) and the new products above, you will immediately notice that the 2016 products look way less Christmasy. 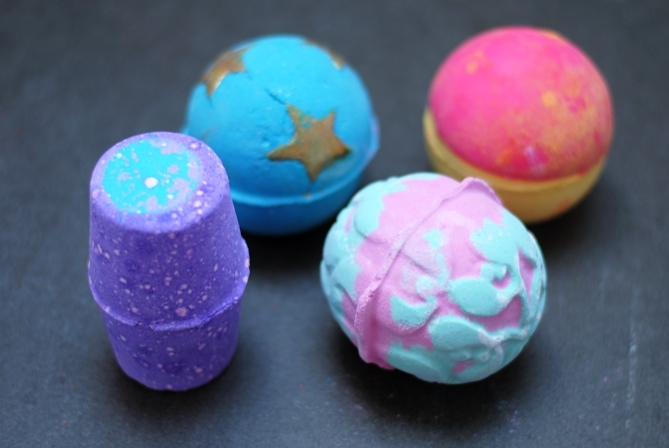 We have a dinosaur, a citrusy bath bomb or a jester bubble bar, but nothing that really screams 'Happy Holidays!'. The only product that is worthy to be called a Lush Christmas product, seems to be the 'Papa Noël'. It's a face wash jelly that looks like Santa's beard. In fact a pretty fun product but unfortunately also the most disappointing one so far. Even though I like the citrusy smell I couldn't enjoy the fun shape as the jelly fell into pieces when I first took it out of the pot. Furthermore the sample I got has to be used until next week, even though I only just got it a few days ago. Quite impossible considering it's 200g. So maybe I was just unlucky with the sample I got but maybe the Lush jelly products simply aren't worth the money after all. 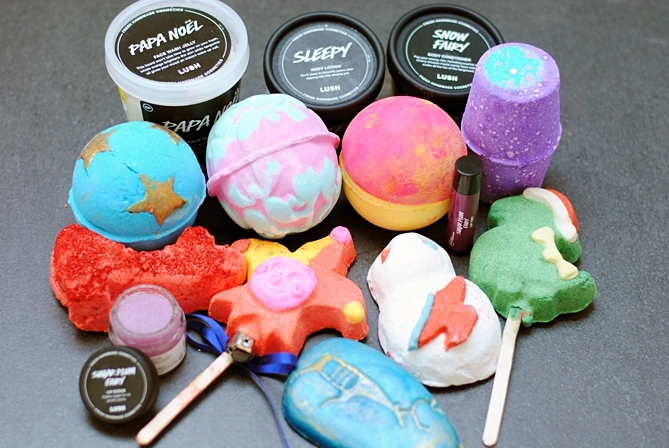 Apart from the 'Papa Noël' I got a bunch of bath bombs and bubble bars that I'll yet have to try. I'm also eager to give the 'Snow Fairy' a go. It's an in-shower body conditioner and if it's as good as the 'Yummy Mummy' from the Mother's Day range I will utterly love it. Furthermore I can already recommend the lip products. 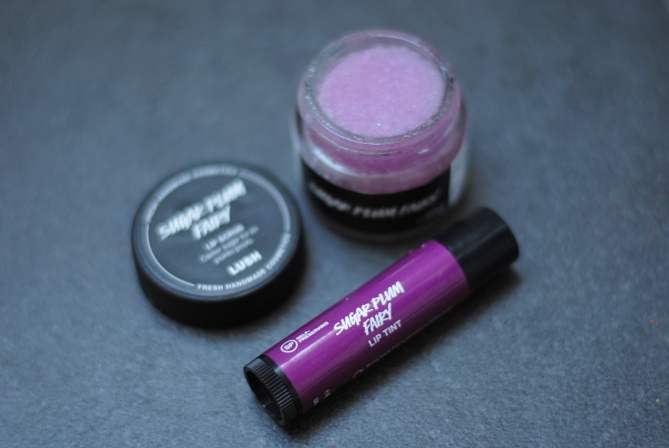 The sugar scrub is called 'Sugar Plum Fairy' and comes in a purple colour this year. Just as the tinted lip balm which is quite highly pigmented. Together they're a combo for perfect lips this holiday season. I really wouldn't recommend buying Lush lipsticks because they are impossible to remove, but their tinted balms are a good alternative. Below you get some of the products close up with the names and prices. If you want me to review one in particular just let me know in the comments.